Ford Motor Company has announced that the 500,000th 6.7L Powerstroke V8 turbo diesel has been installed into a Ford F Series Super Duty pickup – a remarkable milestone for Ford as they continue to be the only company selling a heavy duty diesel truck in the US that relies on a drivetrain that is designed and built in-house. Ford Motor Company introduced their new 6.7L Powerstroke turbocharged diesel V8 engine back in 2010 after having had Navistar International produce the 7.3L, 6.0L and 6.4L Powerstroke diesel engines between 1994 and 2010. Since launching the in-house designed and built Powerstroke for the 2011 model year, it has taken Ford Motor Company just three full model years (2011, 2012, 2013) and a short stint of the 2014 model year to hit the half million mark for Super Duty pickups built with the Powerstroke V8. The truck that received the 500,000th 6.7L Powerstroke V8 was a 2014 Ford Super Duty F350 Lariat built at the Kentucky Truck Plant in Louisville. With 400 horsepower at 2,800rpm and 800lb-ft of torque at 1,600rpm, this truck will hit the streets as one of the most powerful pickups sold in America. Ford is the only automaker selling heavy duty consumer trucks in America that derive their diesel power from both an engine and transmission that are designed, engineered and built in-house. The Ram heavy duty lineup relies on the outsourced Cummins Turbo Diesel engine while the Chevrolet and GMC heavy duty pickups rely on an outsourced Allison transmission. 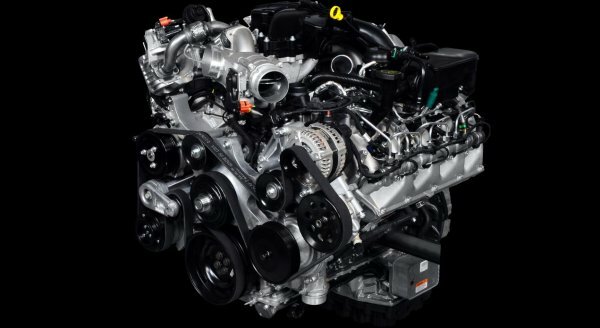 The engineers responsible for the 6.7L Powerstroke diesel knew that this engine – like the trucks that would rely upon it – need to be Ford Tough and when looking at the specifics of the 6.7L V8, it is clear that this is an engine built for longevity and power. Below are some aspects of the 6.7L Powerstroke diesel engine that have made it so popular since being introduced. -Compacted Graphite Iron Engine – This is a stronger material than cast iron with the basic block design optimized for reduced weight and maximum durability while facing the rigors of being a heavy duty engine. -The Unique Inboard Exhaust/Outboard Intake Architecture – this industry first in a diesel engine reduces exhaust system volume which leads to improved spool tires and improved power delivery. This design also helps to reduce engine bay heat generated by a more traditional exhaust and turbo setup. Ford also believes that this design will help make the 6.7L Powerstroke V8 easier to work on, this decreasing downtime for work trucks. -High Mid-Mounted Turbocharger – Unlike other turbocharged diesel engines that have the turbochargers mounted under the truck, the 6.7L Powerstroke diesel has the turbo mounted in the upper middle portion of the engine, which is fed by the unique inboard exhaust setup. -High Pressure Fuel System – This high pressure fuel system helps to deliver five “injector events” per cylinder combustion cycle with eight hole injectors spraying fuel into the chamber. This direct injection system helps to optimize power and efficiency while also cutting down on engine bay noise and harshness. -Aluminum Cylinder Heads – In addition to reducing the overall weight of the engine, these lightweight cylinder heads feature a mid-deck construction with dual water jackets for improved engine cooling while six head bolts rather than four help to provide better cylinder sealing and durability. -B20 Biodiesel Capability - The 6.7L Powerstroke diesel engine is able to run B20 biodiesel, a mix of 20% biodiesel and 80% traditional petroleum based diesel. Ford Motor Company made a bold move by taking the engineering and production of their Powerstroke diesel engine lineup in-house but with such great success over the past four years – we can expect to see plenty more Ford-built Powerstroke diesel engines in years to come.